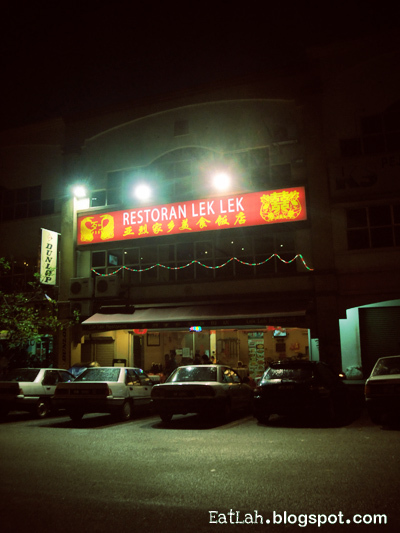 Restoran Lek Lek @ Seri Kembangan, Selangor | where and what to eat lah? The famous Restoran Lek Lek, previously known as Ah Lit or Ah Lek, started out in a shack well hidden in the kampung of Serdang. Now, they have expanded and relocated to a proper double storey restaurant in Pusat Perdagangan SK. Be prepared to feast your eyes on our astonishing list of foods that we had, with portions enough to feed 14 hungry over-sized men. The famous tofu kang soup (RM 60), the consistency of the soup resembles shark's fin soup that has an orange tinge with bits of egg white mixed in. The soup was thick but not overly starchy and gooey. 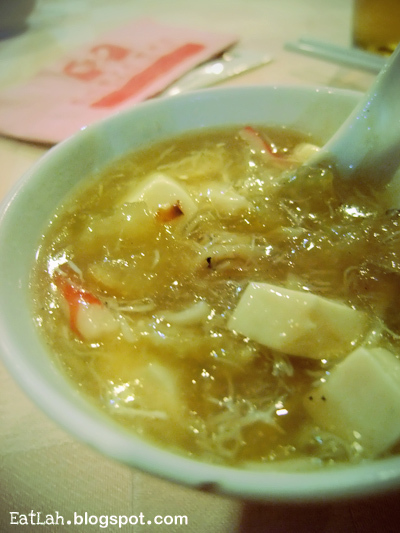 It contains diced taufu, prawn meat, sliced crab meat and fish maw. It was pretty good! 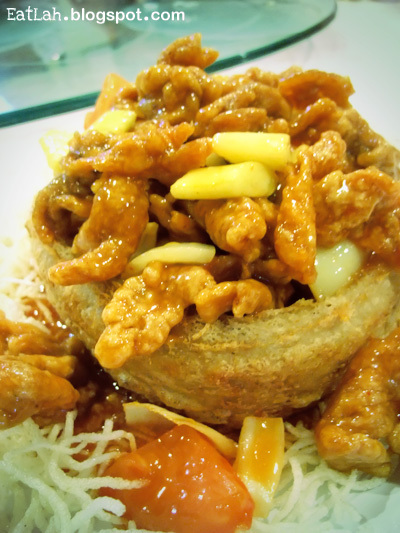 Sweet and sour pork in yam basket (RM 25), a make-over from the traditional sweet and sour pork. Instead of pork cubes, you'll get thin crispy pork slices coated with tangy sweet and sour sauce. It was probably too thin and couldn't really taste the pork, it felt a bit like eating deep fried flour. However, the yam basket was absolutely yummylicious! It was crispy outside with powdery smooth yam inside, definitely a good quality yam for that day. 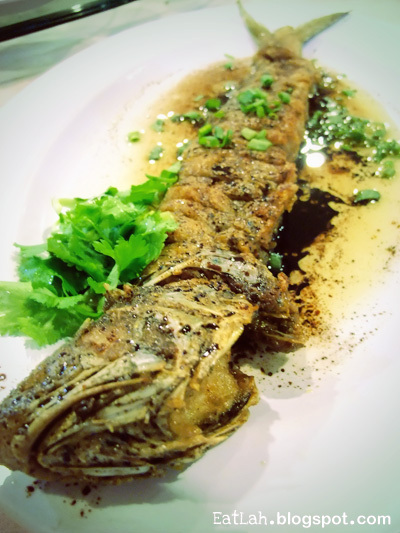 Fa Guat Loong (RM 28) is basically a stuffed boneless ma yau fish. Almost like an art, the fish flesh is firstly removed with the skin intact, made into fish paste, stuffed and reconstructed back into the fish, deep fried and finally served with soy sauce with spring onions as garnish. The fish paste was firm, springy and perfectly seasoned. It was indeed tasty and different, especially with the fish skin intact. 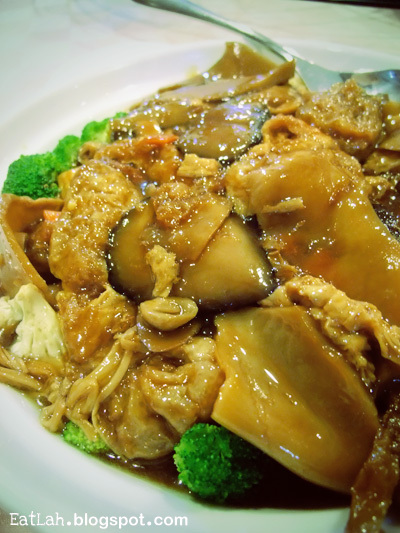 Lo-Hon mixed vegetables (RM 25), fresh green broccoli with braised mushrooms, bean curd bun and vegetarian abalone slices. 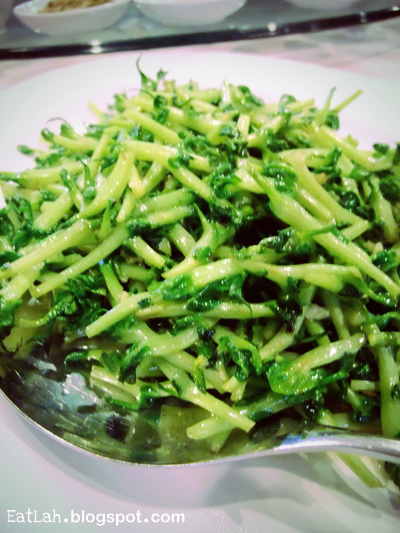 Stir fried kuai fei miew (RM 20), it was thick and juicy sweet with a crunchy texture like Ipoh bean sprouts. 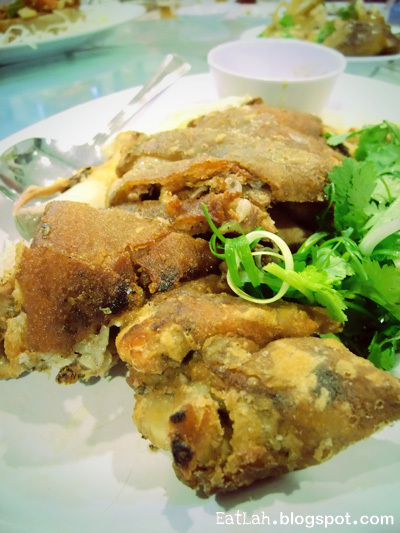 Thai style deep fried pork knuckles (RM 38) served with a special piquant sweet sauce. A huge chuck of delicious pork, crispy on the outside and tender juicy within. It was sinfully perfect, definitely can rival the German counterparts. 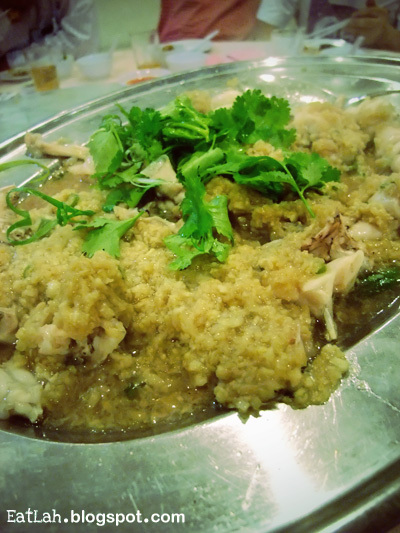 Steamed frog legs with ginger paste (RM 38.50), the delicate fresh meat was sweet and firm. The ginger paste was strong, smooth and it was gingerly spicy syok! 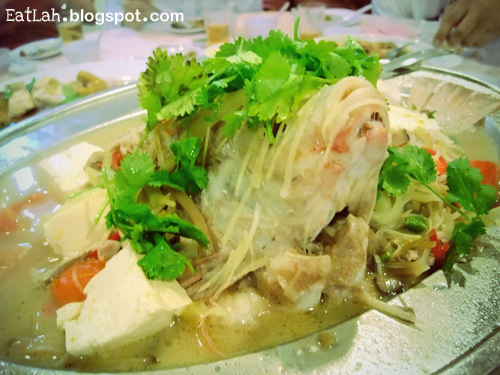 Teow Chew style steamed Talapia fish (RM 35), the fish was fresh and fragrantly immersed with the sourish sweet sauce. 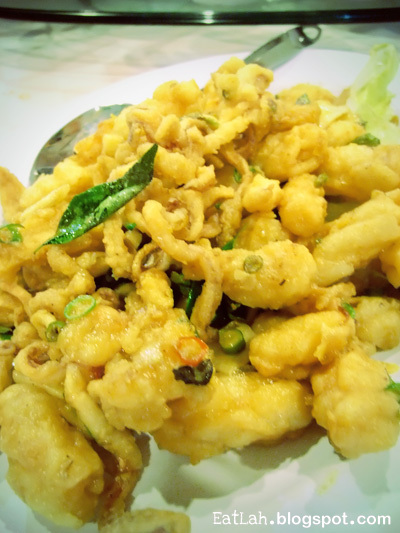 Deep fried salted egg yolk squid (RM 20), crispy on the outside while retaining the sweet and springy squid inside. The salted egg yolk was evenly coated with some spiciness from the chili padi and the aroma from the curry leaves. 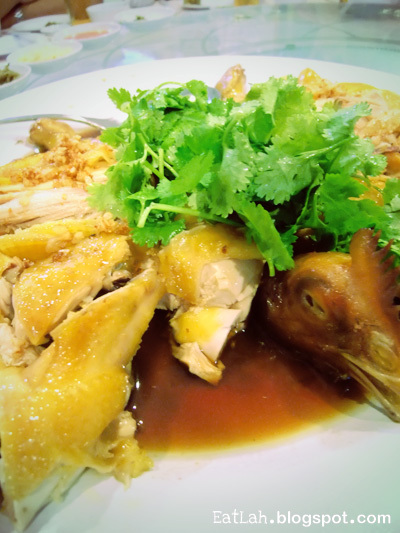 Steamed kampung chicken (RM 80), it was really huge, no wonder it was expensive. Nevertheless, it turned out to be tender, less fats and 'chickenly' tasty. Best served with some chili padi in soy sauce and chili ginger paste sauce. 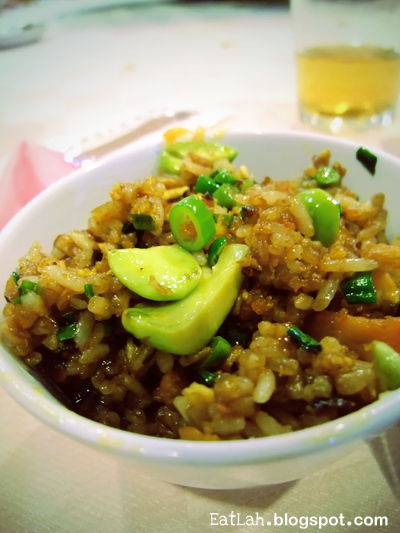 Petai fried rice (RM 20), it was extremely tasty and full of "wok hei". It was really good even for someone that doesn't like the acquired taste of petai which adds a unique taste into the fried rice. Verdict: Definitely worth eating out here again and again! Excellent Chinese food at a reasonable price. i find the food ok only. maybe is because his family frequently go there during occasions. ...I have been told that you are a fantastic chef. But please understand that when promoting shark products to your customers, you are - next to contributing to the extinction of sharks - also urging people to eat poisonous food! Quote: "Tests conducted at the University of Hong Kong discovered that the fins they analysed contained 5.84 parts per million (ppm) of mercury, compared to a maximum permitted level of 0.5 ppm. In Texas, similar tests with fresh sharks have revealed mercury levels up to 15 ppm, together with various other heavy metals, such as lead, even before the fins were dried." wow thanks for the info! Hi everyone, it's my first pay a visit at this web page, and paragraph is truly fruitful for me, keep up posting such articles. site. I want to to thank you for ones time due to this fantastic read! this space to unravel my problem. May be that is you! Looking ahead to peer you. lot of spam comments? If so how do you stop it, any plugin or anything you can suggest? I am having problems with your RSS. I don't understand the reason why I can't subscribe to it. To acquire the tool togo Facebook and perform a search under Purposes for Selective Twitter Rank. The zero day pest originally thought to be feasible with a plot is far worse than before thought. and that is also happening with this paragraph which I am reafing at tthis place. while looking at your home page. This is not a World Class SEO (Www.Sinhalaya.Com) resellers? know what you are talking approximately! Bookmarked. Please also discuss with my website =). Just wondered if you follow any SEO experts? 1st time in to this restaurant...just want to order alrd found out those utilities loke plate.fork and spoon are dirty.stains are dried left on the spoon.this are very disgusting and unhealthy. 1st time in to this restaurant...just want to order alrd found out those utilities like plate.fork and spoon are dirty.stains are dried left on the spoon.this are very disgusting and unhealthy.